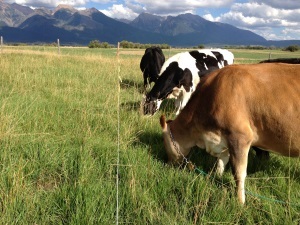 Pasture management in Montana is not just about building fence and moving cows. First and foremost it is about irrigation. Because of our arid climate we rely heavily on irrigation water, which is dependent on mountain snow pack. Every winter farmers and ranchers in the west look to the mountains as they plan for the following year. Good snow levels correlate to a successful growing season. Poor snow levels might mean selling off some stock, planting fewer crops, and preparing a plan for drought. The Golden Yoke’s water starts high up in the Mission Mountains. The melt and subsequent runoff is collected in a series of reservoirs located at the base of the mountains. The water then travels through a complex system of canals and ditches before it reaches our land. This is all controlled by the local water board and in our area this control belongs jointly to the Confederated Salish and Kootenai tribes (our land is located on the Flathead Indian Reservation) and government agencies. With this in mind, we have to manage our pastures with the understanding that we might not have much water when we need it most. Utilizing management intensive grazing in this type of environment is key because it helps increase productivity and soil water retention, build organic matter, and diversify a healthy plant population. Our primary hurdle at this point is that we have too few animals to have the impact that we want. As we build our herd we plan to graze all of our land; right now we graze what we can and hay the rest. 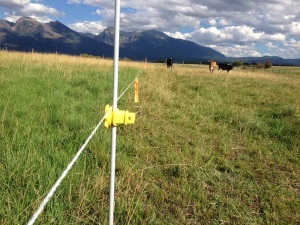 Much like other grazing operations, we use single strand electric fence to contain our cows in “cells.” We move them to fresh grass up to three times a day depending on season and what we want to accomplish within that cell. Our portable “cow-bana,” mineral lick, and their water tank move with them from cell to cell. We try to rest our cells no less than 35 days in order to irrigate and allow plants to recover from the animal impact. Recently, we met with our local NRCS agent to discuss how we could improve the efficiency of our irrigation system. Just after our introductions he commented on our grazing strategy and we new we were talking to the right guy. Little did we know, his office had been holding pasture walks in our area all summer and soon Greg Judy (noted grazing expert from Missouri) would be coming to host a workshop in our community. We are very excited to begin this relationship with NRCS because of all of the educational and financial support that they offer. One of the first things that we hope to accomplish with them is to accurately map our property and form a grazing plan that best suits our land and the nutritional needs of our cows. Over the next eighteen months we will be hashing out the details for a better, more efficient upgrade to our current irrigation system. We will also be working with them to achieve a more nutritionally diverse pasture mix, which will be most important when the cows are in milk. 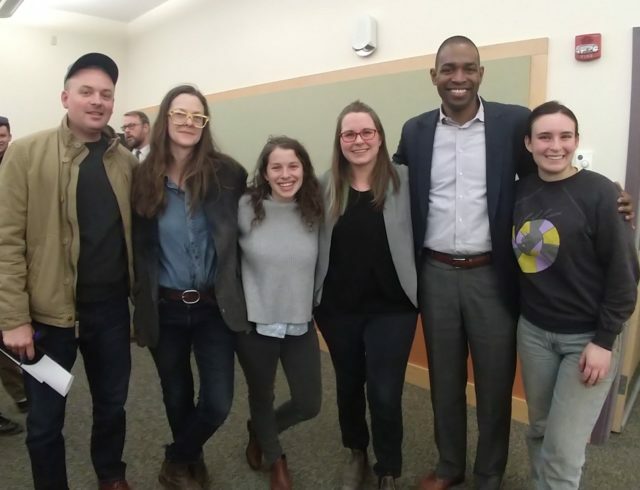 It was great to find out there are other farmers and ranchers in the valley that are experimenting with intensive grazing, and we are excited to join a community of like-minded folks. Until next time, the girls of The Golden Yoke.